Come Explore the beautiful Toccoa River Valley on the Aska Road Adventure Area corridor. Peaceful 'Fairhaven' cabin awaits your visit. You set the pace for your getaway. Our rustic cabin has all you need for a peaceful relaxing vacation. Minutes from major hiking and mountain biking trails. Water abounds with the Toccoa River, waterfalls and beautiful Lake Blue Ridge. Visit historic downtown Blue Ridge with antiques and specialty shops. Within 2 miles of the famous Toccoa River Restaurant. Also you can visit one of two drive-in theaters in the state of Georgia, the Swan Drive In. Private location with 1.5 acres of hemlocks, mountain laurel, seasonal views, private walking trail available with small walking trail on property. Outside decks with hot tub, outside rock fireplace and fire ring. Inside there is a stacked rock gas log fireplace. The cabin interior is decorated with a nice selection of handmade crafts and sturdy antiques. Kitchen is nicely equipped; deck has propane or charcoal grill. What could be better than a night in the hot tub and then a relaxing fire in the outside fireplace or inside with the stacked rock gas log fireplace inside a cozy cabin. We picked this cabin because of the location. So close to Lake Blue Ridge, the Toccoa River, and the major hiking trail hubs. Plenty of dishes and pots and pans. Unless you need special items you will have no problem cooking your family's meals. Living room TV is a Smart TV with Netflix. You can watch with your personal account DISH and Direct TV or use our Netflix. Upstairs TV only has VCR/DVD player attached. We really enjoyed our stay at the cabin. The location is just two hours away from Chattanooga TN and minutes away from outdoor fun. perfect balance of value and enjoyment. The cabin is very quaint & off the road for privacy. It had everything you needed. We had a wonderful time! The home was in a perfect location, with privacy and a large backyard. The kitchen was stocked with everything you could possibly need to prepare any meal! I was also truly impressed and pleased with all the Christmas decorations - I really felt at home! The hot tub was perfect, both fire places were ideal, and I loved having the washer/dryer! We have every intention on returning next year! Thank you, Sheila, your home was fabulous! My family and I spent the last 3 days at his great property. Perfect area in the middle of the north GA mountains. We enjoyed our time with local dining and activities which included riding the Santa Express. Look so forward to visiting again!!! My wife and I with our 2 dogs stayed for 3 nights at this cabin. The cabin is small and comfy for a party of 2. It’s secluded with other cabins close to you but very private. The host communicated very well and fast. The location is great as you have local trails near you and don’t have to go far. Only recommendation is it might need a little bit of upgrade but no biggie. The sofa was a bit uncomfortable as it was a sofa bed. 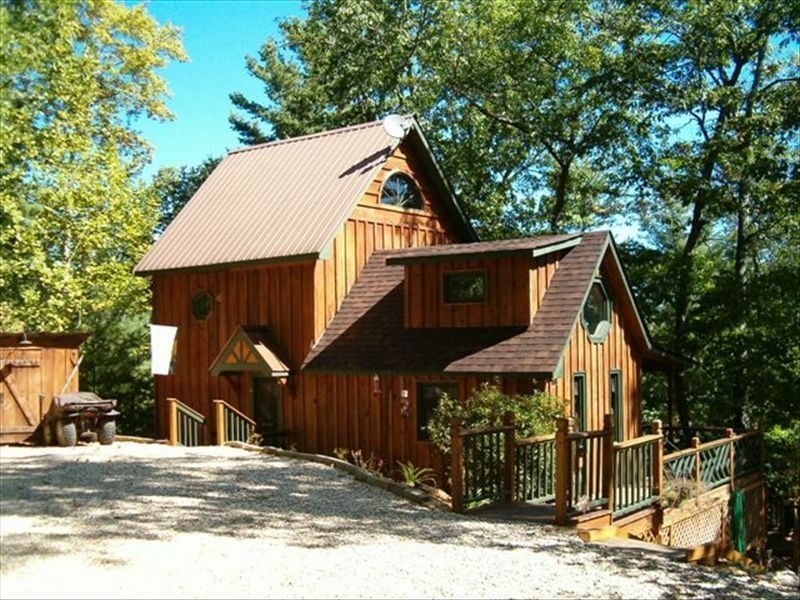 But other than that I do recommend this cabin for a weekend getaway if it’s for 2. Wife and l loved our anniversary stay with our two furry babies. Thank you guys! Blue Ridge Scenic Railway, Drive In Theater, on-site child's hiking trail on 1.5 acres, community hiking trail. Access to trout stream which is located within 10-15 minutes from cabin, please ask about details on this activity.